Ottawa, ON, September 15, 2017 – According to statistics released today by The Canadian Real Estate Association (CREA), national home sales posted a small gain in August 2017. National home sales rose 1.3% from July to August. Actual (not seasonally adjusted) activity stood 9.9% below last August’s level. The number of newly listed homes fell a further 3.9% from July to August. The MLS® Home Price Index (HPI) was up 11.2% year-over-year (y-o-y) in August 2017. The national average sale price climbed by 3.6% y-o-y in August. The number of homes sold via Canadian MLS® Systems edged up by 1.3% in August 2017. The small gain breaks a string of four straight declines, but still leaves activity 13.8% below the record set in March. There was a roughly even split between the number of local markets where sales posted a monthly increase and those where activity declined. 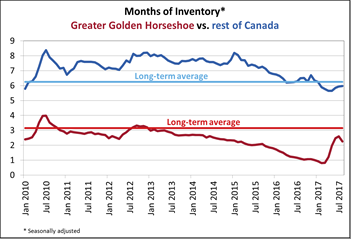 The monthly rebound in Greater Toronto Area (GTA) (14.3% month-over-month) sales fueled the national increase. For Canada net of the GTA, sales activity was flat. While it was the first monthly increase in activity since Ontario’s Fair Housing Policy was announced, GTA sales activity remained well down compared to the peak reached in March (-36%) and year-ago levels (-32%). Actual (not seasonally adjusted) activity was down 9.9% on a y-o-y basis in August 2017. Sales were down from year-ago levels in about 60% of all local markets, led by the GTA and nearby housing markets. The number of newly listed homes slid a further 3.9% in August, marking a third consecutive monthly decline. The national result largely reflects a reduction in newly listed homes in the GTA, Hamilton-Burlington, London-St. Thomas and Kitchener-Waterloo, as well as the Fraser Valley. With sales up and new listings down in August, the national sales-to-new listings ratio rose to 57% compared to 54.1% in July. A national sales-to-new listings ratio of between 40% and 60% is generally consistent with balanced national housing market, with readings below and above this range indicating buyers’ and sellers’ markets respectively. That said, the rule of thumb varies according to local market level. Considering the degree and duration to which current market balance in each local market is above or below its long-term average is a more sophisticated way of gauging whether local conditions favour buyers or sellers. (Market balance measures that are within one standard deviation of the long-term average are generally consistent with balanced market conditions). Based on a comparison of the sales-to-new listings ratio with its long-term average, some 70% of all local markets were in balanced market territory in August 2017, up from 63% the previous month. 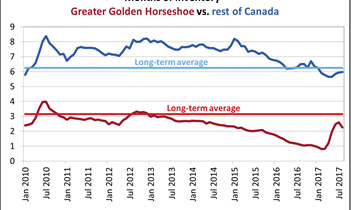 A decline in new listings has firmed market balance in a number of Greater Golden Horseshoe housing markets where it had recently begun tilting toward buyers’ market territory. 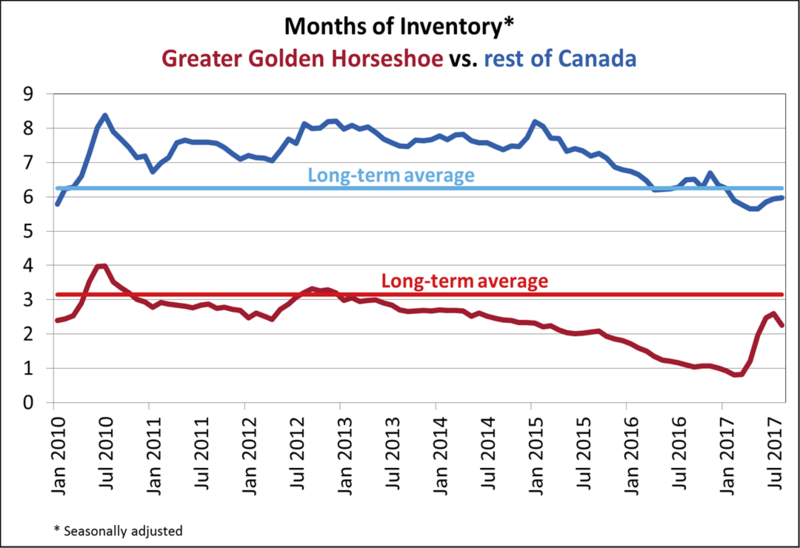 There were 5 months of inventory on a national basis at the end of August 2017, down from 5.1 in July and slightly below the long-term average of 5.2 months. Price gains diminished in all benchmark categories, led by two-storey single family homes. Apartment units posted the largest y-o-y gains in August (+19.5%), followed by townhouse/row units (+14.4%), two-storey single family homes (+8.3%), and one-storey single family homes (+8.1%). 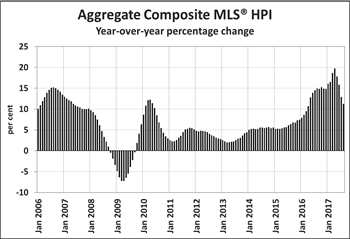 While benchmark home prices were up from year-ago levels in 12 of 13 housing markets tracked by the MLS® HPI, price trends continued to vary widely by region. After having dipped in the second half of last year, benchmark home prices in the Lower Mainland of British Columbia have recovered and are now at new highs (Greater Vancouver: +9.4% y-o-y; Fraser Valley: +14.8% y-o-y). Benchmark home price increases have slowed to about 16% on a y-o-y basis in Victoria, and are still running at about 20% elsewhere on Vancouver Island. Price gains slowed further on a y-o-y basis in Greater Toronto, Oakville-Milton and Guelph; however, prices in those markets remain well above year-ago levels (Greater Toronto: +14.3% y-o-y; Oakville-Milton: +11.4% y-o-y; Guelph: +19.5% y-o-y). Calgary benchmark price growth remained in positive territory on a y-o-y basis in August (+0.8%). While Regina home prices popped back above year-ago levels (+5.6% y-o-y), Saskatoon home prices remain down (-0.3% y-o-y). That said, prices of late have been trending higher in both Regina and Saskatoon and if recent trends hold, Saskatoon prices will also turn positive on a y-o-y basis before year-end. The actual (not seasonally adjusted) national average price for homes sold in August 2017 was $472,247, up 3.6% from where it stood one year earlier. The national average price is heavily skewed by sales in Greater Vancouver and Greater Toronto, two of Canada’s most active and expensive markets. Excluding these two markets from calculations trims almost $100,000 from the national average price ($373,859).